"Why am I in Business?" The brown goods repair trade is being squeezed to the limit. As the price of complex electronic equipment falls due to mass production savings and subsidies from service-providers, the public perception of the value of goods has fallen to an all time low. The mobile telephone repair market died as telephones were subsidised to zero. Now it is happening with satellite receivers (the "free" Sky Digibox). There are two results of this: as manufacturers strive to reduce costs still further, in general the reliability of receivers is becoming worse, not better. The repair is becoming more expensive, time consuming and difficult as we encounter more and more Application Specific ICs (ASICs) and Surface Mounted Devices (SMDs) which can not be handled easily without damage to them or to the board. Whilst the camcorder repair market still provides just enough profit for companies to invest in the expensive equipment required to set up and align the equipment, the same is not true for the rest of the brown goods trade. The spares are expensive or unavailable and the customer is unwilling to spend money on repairs. Not just a repair book! In fact not even a repair book! Common problems and cures listed - many of which you can fix yourself with only the remote control handset or a soldering iron. 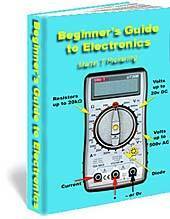 Plus lots of general repair information including how to recognise various components. Written in simple terms, this book also gives the home user valuable advice on how to prevent failure. Read it NOW and save money in the future. But, if the worst happens, read it anyway because it will still save you money. 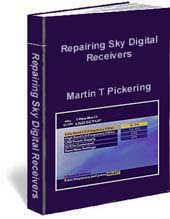 Even the advent of digital satellite receivers brings little promise of enhanced repair profits. Again, the majority of UK receivers are subsidised to the point where the consumer would rather throw the equipment away and buy new, than spend money on repairs. Last week I had a BT SVS250 for repair. The customer told me that he had been quoted £90.00 by a company in Knaresborough who, it seems, are the appointed repair agents for BT. The fault symptom was "no decoder messages." A quick look inside showed that someone had been there before me. Incorrect screws were fitted and the decoder connector was half out of its socket on the main board. Unfortunately, pushing this home did not restore the messages. Replacing an overheated capacitor, on the decoder board, did. The design is such that this capacitor is directly beneath a large heatsink. The fault is designed-in. The receiver was returned to the customer with a bill that was considerably lower than £90.00. Yesterday the same receiver arrived back in the workshop. "Under guarantee," read the note. "Channels not holding; channel adjuster loose; when Sky is switched off, nothing comes on." This is a fairly typical fault report. I've been repairing equipment for many years and still have not come to terms with the fact that 99.9 percent of the population can not describe in words what they see and hear. The actual fault seen after an hour's warm up was a herringbone pattern on all satellite pictures. Freezer spray quickly pinpointed a capacitor on the main board as the culprit. No other fault was found after a 3 hour soak test. Now, the customer thinks this is under guarantee from the previous repair to the decoder board. I wonder how other dealers cope with this situation? It's rather like taking your car back to the garage and complaining "You fixed the engine misfire last week and now I've got a flat tyre. It's under warranty isn't it." Do you think that the garage would accept that? No, so why should we. I'm beginning to take a harder line with my customers. If they want to know what parts were changed, that's an "Engineer's Report" which costs £25.00. I guarantee only the parts that I fit and the workmanship. My work carries no guarantee whatsoever if somebody else has already had a "look" inside. If something else goes wrong I charge again. Profit is so low that I've been forced into this situation. A few years ago I could have absorbed a few "guarantee" repairs but not any more. I am beginning to issue a printed disclaimer with every repair, setting out precisely what is and is not accepted "under warranty." I also charge for testing, if no fault is found. Exactly where I stand legally remains to be seen. Another problem is spares availability. The only company for which I have time is Pace. They seldom report "out of stock" and prices are reasonable. Amstrad passed its satellite spares business to CPC and, although they give an excellent service, there is the problem that it can take months to obtain components from the far east and some parts are simply unobtainable at a sensible price. Easier to understand than anything you've read previously! Martin has a knack of explaining technical subjects in simple language. Components covered include resistors, diodes, transistors and capacitors. This is NOT just another boring technical book full of mathematical equations. You'll like it! Parts for BT-SVS250 and SVS300 receivers appear to be non existent. Why am I telling you all this? Well, it will amuse other engineers and it might educate you, the general public. At the very least you will know why I'm so grumpy on the phone when, firstly, you ask me to ring you back and then you keep me hanging on because you don't even know the model number of your own equipment! "Hello, my car's making a funny noise." "Yes, sir, what model is it?" "Ah, it's red. Hang on while I just pop round the corner and have a look........"
"....Umm, actually it's green not red. It's a Ford." "Yes, sir, and the model?" "OK, never mind, how many doors has it got?" "Hang on while I just..."
You can laugh but this is precisely what I get when I ask what model satellite receiver? ("Videocrypt"), type of LNB? ("A black one"), size of dish? ("The same as next door"). You can tell how long ago I wrote this. Can you see a BBC Micro to the left of that old Apple Mac Quadra? I don't use those any more! I don't do any repairs any more!